Remember that large empty space void of loveliness? Well it's finally filled with beauty! If only the energy I expended on this chandelier was considered a workout... What material should it be? What color? How wide? How tall? Shades or no shades? It's ridiculous really, the amount of time and effort I put into this decision. It's a little something I like to call obsessive behavior... It was a big purchase however, and one that deserved a bit of planning. Anyway, it went up without a hitch and I think it makes the room. It fills the void as expected, isn't too heavy, but definitely makes a statement. I couldn't be happier! Call Antiquaire if you're interested! Oh wow Jan! Well worth every little bit of decision workout!!! It does fill the void for sure and makes a glam statement! I luv it. Well done on a fab choice and I think we all understand that kinda behavior just to well, as a matter of fact we partcipate equally...lol. 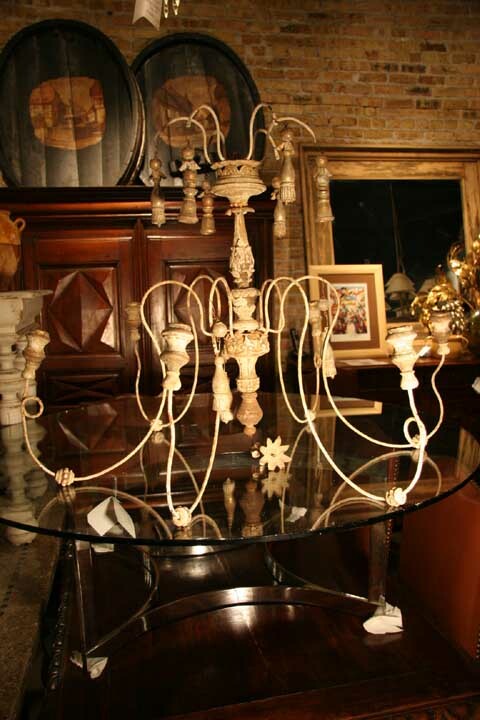 Have a great weekend and enjoy your chandelier! I love your blog!! Your sitting room is a true inspiration!! So funny "if the energy spent on this chandelier was considered a workout" boy, can I relate!! Well for what it lacked in burning calories it more than made up for in spades, in adding beauty to your room! A perfect choice, it is simply stunning! I just love it- the whole room is breathtaking, and this was the crowning touch! (Thanks for your comment and adding me to your blog roll, just added you too) Love your blog! The Chandelier looks great...room is beautiful!! Energy well spent! Love your decorating style...and your blog. Hi Jan! I'm coming over to see you from Alison's blog and she was showing us your beautiful home! It's gorgeous and I'm your newest follower. I published the post featuring your most lovely home blog! Your new chandelier is gorgeous. You were right.... it is the perfect thing for this space. Excellent choice! PS, forgot to say, I will be your newest follower! An amazing chandelier! Your home is beautiful. I am visiting from The Polohouse. I just signed up as your latest follower. Come visit me when you have time! I'm also a new follower who wandered over from The Polohouse. Allison has a wonderful post on your place. Your chandelier is marvelous and so is your house. Perfect! Worth all the time and effort!!! That is perfect in that gorgeous room. Love it. I love your style! Alison sent me over. Jan your chandelier is gorgeous and looks so wonderful in your living room!